(CNN) — As the airline industry piles on against him, the man who ordered knives to be allowed on U.S. commercial airliners defended his decision Thursday on Capitol Hill. After his testimony at the Homeland Security subcommittee hearing, Pistole was expected to face questions from lawmakers who are concerned about traveler safety in a post-9/11 era. Supporters believe the rules should be more passenger-friendly and focus on larger threats. Critics believe even small knives pose too much of a risk for airline crews, arguing that box-cutter knives were used in the 9/11 attacks. In the nine days since the TSA opened a can of worms by announcing it would ease the ban on small knives in airline cabins, the list of groups concerned or opposed to the idea has grown to include airlines, airport screeners, federal air marshals, flight attendants and pilots. Rep. Michael McCaul, R-Texas, supports the rules change. Commercial aviation must be secure from threats as the highest priority, but Pistole also has a priority to make the TSA both “more passenger-friendly and threat-focused,” McCaul said in a recent statement. Former TSA head Kip Hawley — who agrees with the change — said sharp objects can no longer bring down aircraft. The TSA made its decision after a threat assessment determined that allowing small knives in cabins would not result in catastrophic damage to aircraft. But after consulting with Federal Air Marshal Service leaders, the agency opted to continue excluding knives that most closely resemble weapons, specifically knives with blades that lock in place, or have molded hand grips. Box cutters and razor blades also would remain on the prohibited items list. The rules are to go into effect on April 25. The agency is aligning its knife policy with the International Civil Aviation Organization, which includes the United States and 190 other member nations. The group says each member exercises its own discretion about how to deal with the issue of knives in the cabins. 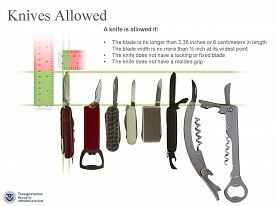 Under the new rules, knives with blades that are 2.36 inches (6 centimeters) or shorter and less than a half-inch wide will be allowed in airline cabins so long as the blade is not fixed or does not lock into place. Airlines for America, the airline trade association, said Monday that “additional discussion is warranted” before small knives are allowed on planes. Many critics of the new rules contend that in addition to adding an unnecessary threat to the safety of airline crews and passengers, the changes won’t make a difference in the TSA’s ability to concentrate on other threats. Knives are probably the most common items surrendered by passengers at screening points, aside from liquids. Travelers surrender about 35 knives at Baltimore-Washington International Airport on an average day and about 47 per day at Los Angeles International Airport, officials say. Residents of Newtown, Conn., the scene of a school massacre in which 20 children and six adults were killed last month, joined thousands of people gathered on the National Mall in Washington on Saturday for a march supporting gun control. 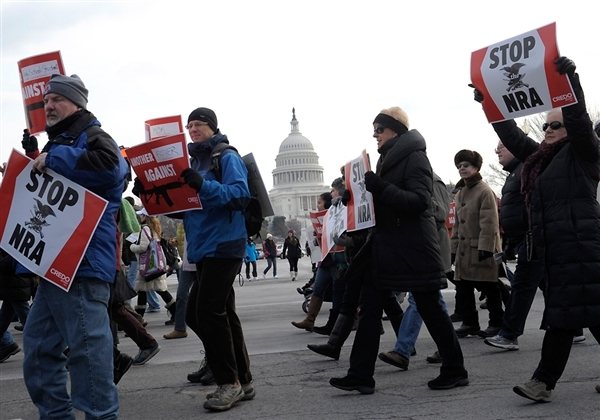 Similar organized demonstrations were planned in support of gun control in about a dozen other places across the United States, according to organizers. In addition to the 100 people who traveled together from Newtown, organizers told The Associated Press participants from New Jersey, New York and Philadelphia would join the demonstration. Education Secretary Arne Duncan addressed the crowd, saying he and President Barack Obama would work to enact gun control policies, the AP reported. “This is about trying to create a climate in which our children can grow up free of fear,” he said, according to the AP. “We must act, we must act, we must act,” Duncan said. According to the AP, demonstrators held signs that read “Ban Assault Weapons Now,” “Stop NRA” and “Gun Control Now.” Other signs carried the names of victims of gun violence. The silent march is organized by Molly Smith, artistic director of Washington’s Arena Stage, and her partner. “With the drum roll, the consistency of the mass murders and the shock of it, it is always something that is moving and devastating to me. And then, it’s as if I move on,” Smith told the AP. “And in this moment, I can’t move on. I can’t move on. The event is co-sponsored by One Million Moms for Gun Control, an independent organization that is also responsible for similar demonstrations in cities such as San Francisco, Chicago and Austin, Texas. The Newtown massacre has reignited the debate over firearms in the United States, and last week Obama laid out a series of measures intended to curb gun violence, most significantly proposals to limit the size of ammunition magazines, ban assault weapons and require universal background checks on firearm purchases. That plan won little praise from Republicans. Earlier this month, New York lawmakers approved the toughest gun control law in the nation, expanding the state’s existing assault weapons ban and addressing gun ownership by those with mental illnesses. The Pentagon’s war crimes prosecutor has decided to no longer seek a conspiracy conviction at the Sept. 11 death penalty trial, a move designed to shore up the case after a federal court undercut the authority of the Guantanamo war court three months ago, the Defense Department said Wednesday. The announcement means that reputed 9/11 mastermind Khalid Sheik Mohammed and four alleged accomplices would still face a capital trial at the U.S. Navy base in Cuba. 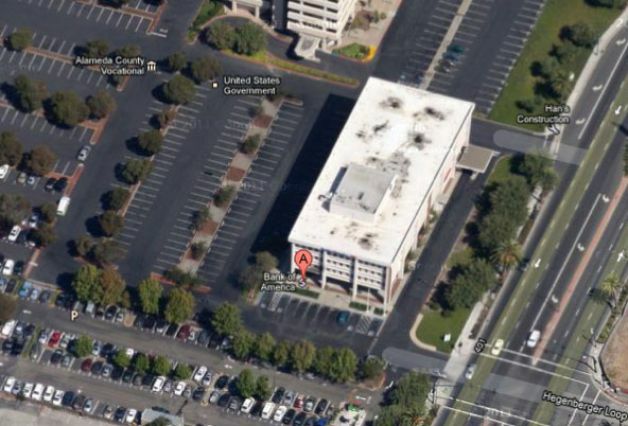 The next pre-trial hearing is Jan. 28. But the Pentagon would allege seven rather than eight war crimes, notably 2,976 counts of murder — one for each person killed when terrorists hijacked passenger planes and crashed them into the World Trade Center, the Pentagon and a Pennsylvania field on Sept. 11, 2001. Other alleged crimes include terrorism and hijacking aircraft. A senior Pentagon official, retired Vice Adm. Bruce MacDonald, has yet to sign off on the move. But the Defense Department statement made clear that the 9/11 prosecutor was trying to drop the conspiracy charge to make the case less vulnerable to civilian court challenge. “This action helps ensure the prosecution proceeds undeterred by legal challenge,” Army Brig. Gen. Mark Martins said the statement, which was released Wednesday afternoon. At issue is the Oct. 16 ruling by the U.S. Court of Appeals for the District of Columbia Circuit that overturned Guantanamo’s best-known conviction — that of Osama bin Laden’s driver. The federal court said the Pentagon had no authority to prosecute the driver, Salim Hamdan of Yemen, on a charge of “providing material support for terrorism” because his alleged crimes took place between 1996 and Nov. 24, 2001, when he was captured in Afghanistan. Congress for the first time defined “providing material support for terrorism” as an international war crime in 2006. Now, the federal court is hearing a similar case that argues “conspiracy” also was not an international war crime at the time of the Sept. 11 attacks. That case is an appeal by Ali Hamza al Bahlul, a Yemeni who is the only prisoner among Guantanamo’s 166 captives currently serving a judicially imposed life sentence. The conundrum created by the conspiracy charge, and its proposed withdrawal, provided critics with another opportunity to question the war court that President George W. Bush created and President Barack Obama had reformed. “Each time the government overreaches, eventually the courts push back. The latest move by the prosecution makes clear that it recognizes the fragility of the entire process,” said Andrea Prasow, senior counterterrorism counsel at Human Rights Watch. “The military commissions, even absent conspiracy charges, are still fundamentally flawed,” she added. 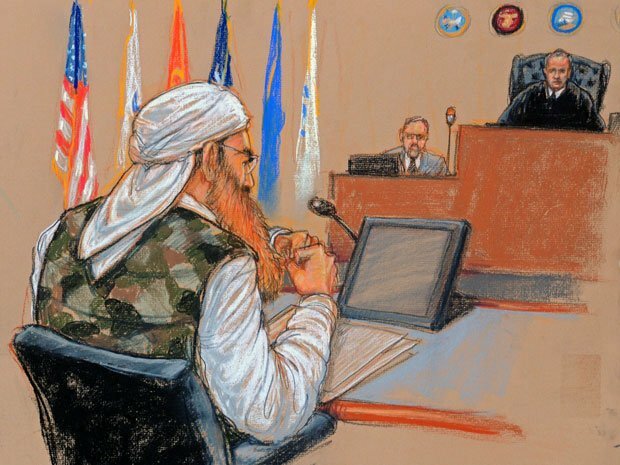 Those charged are: Mohammed, 47, a Pakistani who in a transcript of a secret 2006 military hearing at Guantanamo bragged that he devised the Sept. 11 attacks “from A to Z”; two alleged deputies in the “enterprise,” Ramzi bin al Shibh, 40, and Walid bin Attash, 34, both Yemeni; Mustafa al Hawsawi, 44, a Saudi, and Ammar al Baluchi, 35, a Pakistani. Conspiracy is the No. 1 alleged crime on the Pentagon’s Sept. 11 charge sheet — and lays out 167 specifications, a narrative that spanned five years of meetings, training, travel and terror that began in 1996 with bin Laden’s declaring a jihad against America and Mohammed met with bin Laden to propose a plot of hijacking airplanes into buildings. The Saudi and Baluchi, who is Mohammed’s nephew, are allegedly implicated in the conspiracy by allegedly helping the 19 Sept. 11 hijackers with wire transfers and travel arrangements to reach U.S. soil. 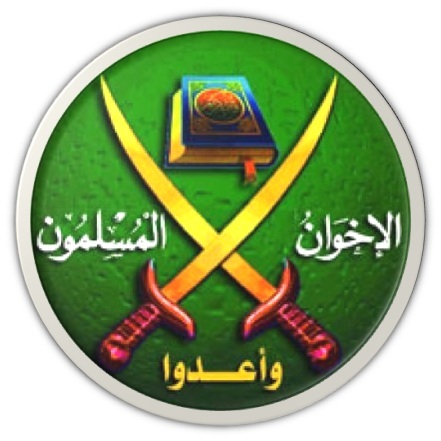 “Withdrawal of the conspiracy charge essentially removes the heart of the body of charges currently pending against Mr. al-Hawsawi,” said Navy Cmdr. Walter Ruiz, his military defense attorney. The Defense Department did not release the new narrative that the prosecution would be pursuing. The move left a number of open questions, chief among them whether the Justice Department would ask the U.S. Supreme Court to take on the Hamdan case. It has until Jan. 14 to file a petition with the justices. In a federal filing on Wednesday in the Bahlul case, Justice and Defense Department attorneys argued that the Hamdan ruling was wrong. But they said, given that decision, the court should rule swiftly and overturn Bahlul’s conviction, in what appeared to be a bid to move the issue along to the U.S. Supreme Court. “In short, particularly with respect to conspiracy, it is plain that Congress authorized the military commission here to try Bahlul for this offense,” the government lawyer wrote. Bahlul’s Pentagon paid appellate attorney, Michel Paradis, said he would not discuss the development because the prisoner had asked him not to make comments on the case. It seems that ,the present terrorist, found dead in, the Peshawar terrorist attack, with skull and horns of Iblis, tattooed on his back, & with a Russian background is a disciple of this order. After all the new world order, needs to establish its writ by terror alone. while, the grand masters, of the masonic lodges, behind the curtains, preach the mysteries of unknown. If you take the term, Illuminati’ from the Arabic point of view, it better interprets, its meaning, illum’ means light/knowledge, and ’i’ of the, and ‘nati’ denotes, Satan, ‘Iblis’ and his associates, which would mean, knowledge of Lucifer and his associates. It is a human failing to go in the riddles of unknown, and more they be twisted, the better liked. The west is ever obsessed to own all past knowledge, hence takes credit for all, and everything eventually has to be linked with Latin or Greek Languages and its related Literature and Mythology. Such is the case here too, hence ‘Illuminati’ is declared to be the plural of Latin word, ‘illuminatus’ or enlightened. To keep the Greeks happy, The birth of Illuminati is attributed to ‘Pythagoras’ the Greek [570 BC] born on the Greek island of ‘Samos’, but it is stated that he was taught to perform the miracles, by a Greek mystic,’Pherecydes’, who technically introduced Pythagoras, to the Doctrines of the Illuminati, meaning thereby, that, it had existed in some form before too. Pherecydes, introduced Pythagoras to the high priests of Egypt, and after pherecydes died, the pupil sailed off to Egypt, and were he met, the inner circle who taught, him, the mysteries, and advanced mathematics, Which were the high priests of ‘Heliopolis [city of Sun or Ain Shamsi, one of the oldest cities of ancient Egypt],and ‘Memphis,[south of Cairo] and Thebes [Waset / the city of the scepter],the pupil was, also taught Astronomy by the Chaldean’s, The Geometry by the Phoenicians, and the Occult knowledge by the Persian ‘Magi’. Here in Persia Pythagoras also met ,’Zarathustra’ the prophet of the Zoroastrians. To make Pythagoras, the part of Latin world it is attributed that, he moved with his disciples and knowledge to ‘Croton’ in south Italy, and Illuminati is re-born, here, and Pythagoras became the First Grand-master. And he would address the public from behind a screen / curtain, only those who had graduated in the levels of mystery had access to him, and were so called the ”Mathematikoi” or the Mathematicians, those who were ;listeners only were termed as,’akousmatikoi’. A secret language, and numerical codes, symbolic messages, initiation rites, special handshakes, compasses & set squares, tools of mathematics were the symbols-as seen in the Masonic lodges. A Missouri state transportation official is wary of potential negative publicity but says that doesn’t outweigh the advantages of clean roads. A half-mile stretch of highway running through the city has been adopted by The St. Louis 9/11 Questions Meetup Group, which will have its name posted along the segment it’s committed to keep litter-free. A conspiracy-touting group alleging that 9/11 was an “inside job” has been granted permission to adopt a stretch of highway in Missouri, the state’s Department of Transportation confirmed Thursday. Under the state’s Adopt-a-Highway program, the small but controversial organization — called the St. Louis 9/11 Questions Meetup Group — will have its name posted on a sign along a half-mile stretch of highway in St. Louis, according to an official at the Missouri Department of Transportation (MoDOT). The sign will go up in January. In return, the group will maintain and keep clean the stretch of highway. On its website, the group sells T-shirts that say “The 9/11 debacle was an Inside Job!” along with other shirts featuring photos of the collapse of the World Trade Center with text that raises questions about the details of the destruction. The group’s organizer, Donald Stahl, could not be reached for comment. Tom Blair, a MoDOT assistant district engineer, said he’s wary of any negative publicity the controversial group will bring to the state, but that the value of clean roads — and the savings the program brings to taxpayers — ultimately outweigh any bad attention. According to the MoDOT website, approved groups adopt a stretch of highway at least a half-mile long and agree to collect litter at least four times a year. The state saves about $1 million a year from the volunteer efforts, Blair said.